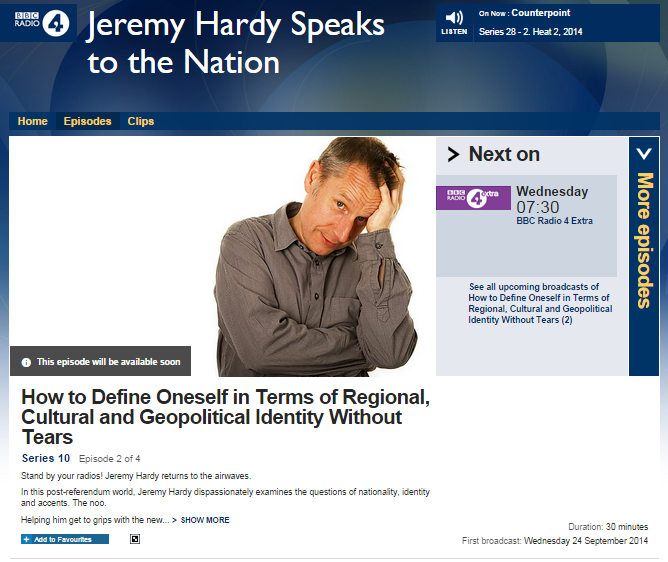 Judging by our inbox, quite a few of the people listening to BBC Radio 4 whilst in the midst of preparations for Rosh HaShana eve on September 24th were not amused by the BBC’s decision to air the polemics of anti-Israel activist Jeremy Hardy in an episode of the programme “Jeremy Hardy Speaks to the Nation” titled “How to Define Oneself in Terms of Regional, Cultural and Geopolitical Identity Without Tears”. “People who don’t have the right to national self-determination are likely to want it. Tamils, Tibetans, Basques, Kurds, Palestinians. 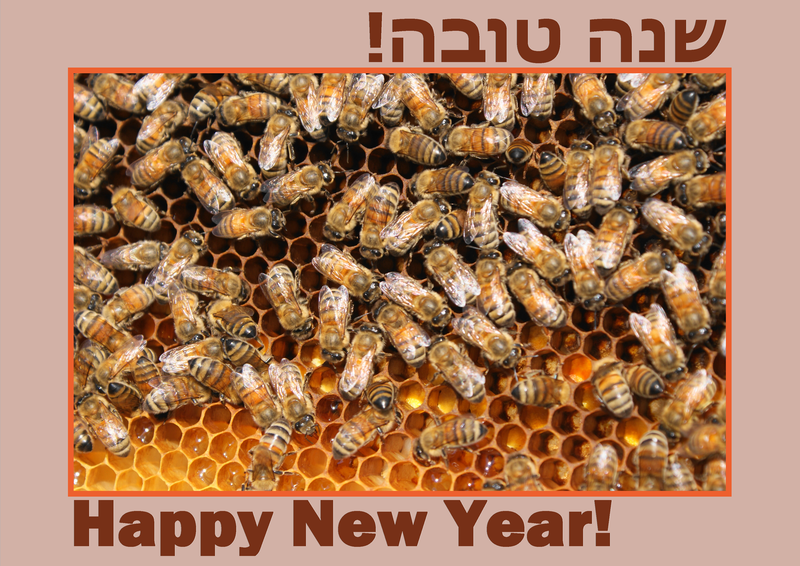 And to take one of the more talked-about territorial disputes of our age, the State of Israel came about because some Jewish people wanted somewhere that a widely persecuted, dispersed, ethno-religious group could have a national home. Sadly one of the things that shapes our identities is other people being bastards to us. […] Zionism was a mixture of secular nationalism, religious separatism and desperation. The main problem with the plan was that the place chosen already had people living there. Palestine was ruled by Turkey until the First World War, after which it fell under British colonial administration. Yes – I’m afraid it’s another one of ours: we who have been responsible for so many partitions and nearly got our comeuppance last week. The first British governor of Jerusalem, Sir Ronald Storrs, described the idea of the new Jewish homeland as ‘a little loyal Jewish Ulster in a sea of potentially hostile Arabism’. A prescient warning you might think, but this was a man speaking in favour of the idea. And the British encouraged significant Jewish migration on taking charge. There is the narrative that Palestine had been an empty wasteland – which is a lie. Yes, the new arrivals were industrious: you’re not gonna get that many people turning up from Poland without seeing a lot more construction than the British would get. But there were already Palestinian towns, villages and farms, mosques and churches that had been there for centuries. Nevertheless, even some of Israel’s most passionate critics today are people who supported its founding in 1948. They argue that although Israeli governments are increasingly racist and colonial, the founding principles were noble. Other critics would see even that view as rosy-spectacled but whatever you think about that period, the State of Israel exists and one of the frequent demands of its government is that others recognize its right to exist. I’m not sure any state has rights. Whether a person has rights is a moral question – they’re not like kidneys – but at least ethical judgments apply more sensibly to human beings. We’d all say a person has a right to a house. We wouldn’t say the house has rights. No-one thinks a house has a right to exist: certainly not an Israeli driving a bulldozer. Let’s imagine that all Israel’s critics recognize its right to exist as a de-facto state. That wouldn’t guarantee its continued existence in its present form or any other. Even now we don’t even know where its borders are supposed to be, so what are we ratifying? That’s what happens when you’re greedy: you keep getting bigger and bigger and bigger – people have trouble recognizing you. So as we see, in addition to inaccuracies such as the representation of the Mandate for Palestine as a British colonial project, the claim that the British “encouraged Jewish migration”, the (obviously) unsupported claim that Israeli governments are “racist and colonial” and the falsehood that “greedy” Israel is “getting bigger and bigger”, Hardy aims for cheap and easy laughs by using offensive stereotypes of Israelis as being violent and aggressive. Given Hardy’s track record of collaboration with the ISM, one would probably not have expected anything other than the exploitation of a ‘comedy’ show for the promotion of his own embarrassingly uninformed politics. That, of course, is a factor of which Radio 4 editors must have been aware in advance but, as we have seen before, the BBC seems to think that the promotion of inaccurate information and crude national stereotypes is perfectly acceptable – just as long as a ‘comedy’ label is appended. 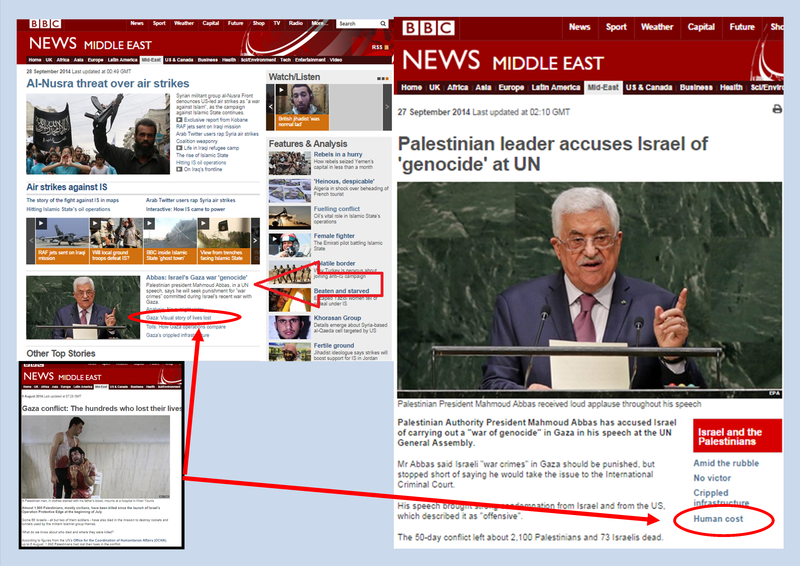 The BBC News website’s presentation of its recent report on Mahmoud Abbas’ speech at the UNGA (discussed here) included several ‘related articles’ offered to readers both on the Middle East homepage and in the article itself as complimentary information on the topic. Among those articles was one originally published on August 8th under the title “Gaza conflict: The hundreds who lost their lives“. Not only is that feature long out of date but – as we pointed out here when it originally appeared – it is also inaccurate on the topic of Israeli casualties with both its text and a graphic claiming to inform readers “where people were killed” presenting incorrect information. 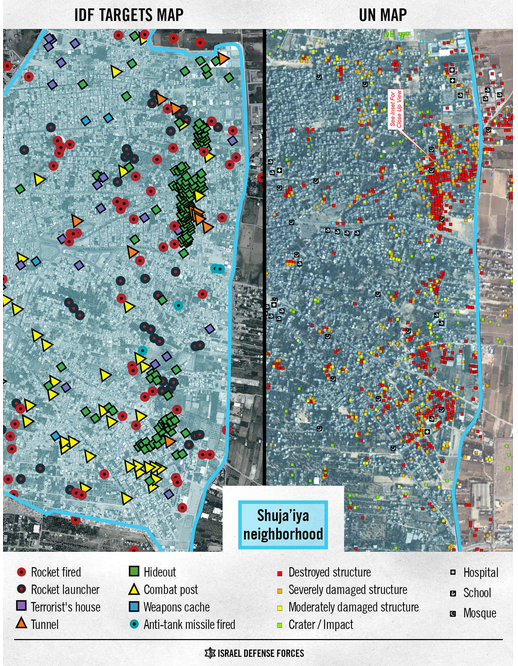 “The article also includes some glaring inaccuracies with regard to Israeli casualties. Although this feature has remained available to BBC audiences online since its original publication nearly two months ago, no effort has been made to correct its inaccuracies. The editorial process which lies behind the continued promotion of a feature which is both so obviously out of date and incorrect must surely be called into question. 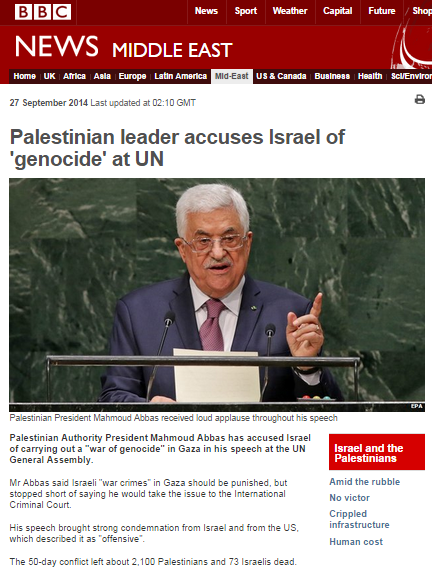 If – as one sincerely hopes is the case – it can be assumed that BBC staff are sufficiently well-informed to be able to recognize Mahmoud Abbas’ inaccurate and repeated use of the term ‘genocide’ to describe this summer’s conflict in his recent speech at the UNGA as nothing more than the agitprop that it is, then one must necessarily ask why BBC editors considered it appropriate to plaster that and additional defamation on the pages of the BBC News website. One must also ask why the September 27th article titled “Palestinian leader accuses Israel of ‘genocide’ at UN” makes no effort to clarify to readers that the accusation amplified in its headline and in the body of the report is entirely baseless and that Abbas’ additional accusations of “war crimes” have not been proven in any legal forum. 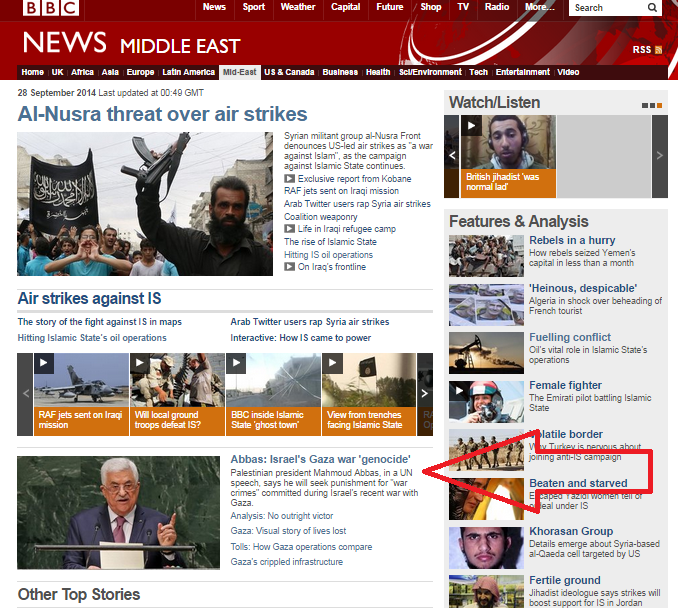 The BBC’s report on Abbas’ polemical speech is highly selective, dealing only with specific parts of its content. “Palestinian Authority President Mahmoud Abbas has accused Israel of carrying out a “war of genocide” in Gaza in his speech at the UN General Assembly. “Mr Abbas said the scale of damage in Gaza was unprecedented and surpassed that of earlier wars. “This last war against Gaza was a series of absolute war crimes carried out before the eyes and ears of the entire world, moment by moment,” he told the UN General Assembly in New York. He added that it was “impossible” to return to negotiations with Israel that did not address what he called “fundamental questions”. Notably, the BBC ignored Abbas’ delusional and embarrassingly uninformed claim that the “devastation” in Gaza is “unmatched in modern times”. It erased from audience view his hallucinatory allegations concerning Jerusalem and the Al Aqsa mosque and – perhaps most significantly – Abbas’ references to “our national struggle established by the Palestinian fedayeen […] in early 1965” and “Al-Nakba of 1948” which clearly indicate that his interpretation of the causes of the conflict (and its solutions) does not begin in 1967. That point is of course critical to proper understanding of the rest of Abbas’ speech, including the short sections which the BBC did elect to report. The BBC is of course perfectly entitled to report inaccurate and misleading allegations and claims made by Mahmoud Abbas or anyone else. What it is not at liberty to do is to mislead audiences by failing to provide them with the relevant factual information which would enable them to put falsehoods amplified by the BBC into their correct context. A recent report in the Guardian reveals that the editor of BBC Radio 4’s flagship news and current affairs programme ‘Today’ thinks that its coverage of the recent conflict in Israel and the Gaza Strip has contributed to reduced numbers of listeners. 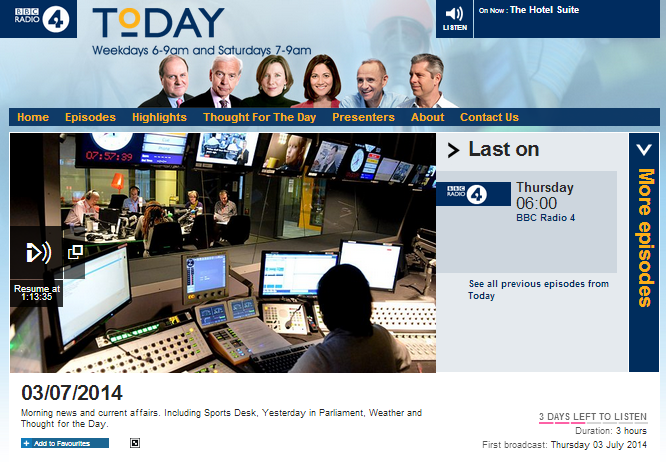 Notably, Jamie Angus attributes the drop in numbers of listeners to a non-existent factor. Indeed, the BBC does have an office in Gaza City and in addition to that, between July 8th and August 26th BBC journalists reporting from the Gaza Strip included Yolande Knell, Jeremy Bowen, Lyse Doucet, Paul Adams, James Reynolds, Ian Pannell, Martin Patience, Quentin Somerville, Jon Donnison, Chris Morris, Orla Guerin and Kevin Connolly. For most of that period there were typically at least three BBC foreign correspondents in the Gaza Strip, together with their support crews and along with the permanent local staff. 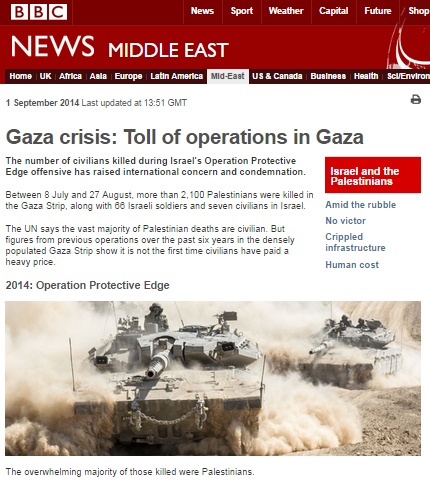 The sheer volume of reporting produced by BBC staff during those seven weeks clearly undermines the claim that the corporation could not easily “report from the ground”, as does the well-known fact that the Gaza Strip is – as indicated by the arrival of some 700 international journalists this last summer – one of the easier places from which to report. Revealingly, the issue with which Mr Angus appears to be less concerned is the content and quality of BBC reporting from the scene rather than its mere amount. Had the BBC adopted an editorial policy which ventured beyond repetitive, homogeneous, context-free ‘disaster zone’ style depictions of casualties and damage and instead actually lived up to its existing commitment to provide audiences with factual and impartial background information on issues such as the reasons for the conflict and its development, listeners might well have felt that they were being informed rather than herded towards a specific view and hence shown more interest in what the BBC had to offer. But in fact, during seven weeks of coverage, audiences were fed little which deviated from repeated emotive, context-free ‘reporter in the rubble’ reports and politically motivated campaigning items. Unsurprisingly, Angus’ statistics suggest that BBC audiences may expect higher quality fact-based content from a programme purporting to deal in news and current affairs. 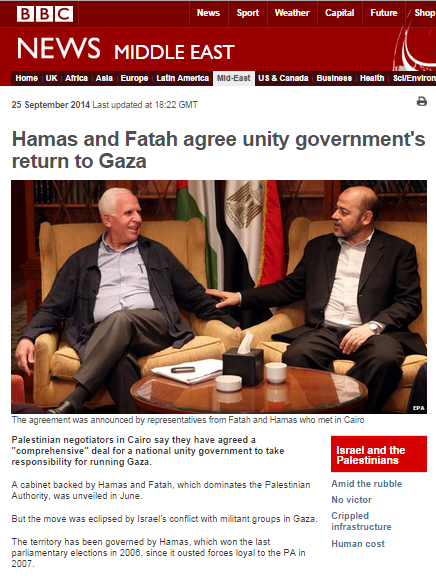 September 25th saw the appearance of an article titled “Hamas and Fatah agree unity government’s return to Gaza” on the BBC News website’s Middle East page. The report opens with the specious suggestion that the reason that the Palestinian Unity Government which came into being on June 2nd has not brought the Gaza Strip under its authority to date is the conflict between Israel and Hamas which began 36 days after that government’s inauguration (and which it did nothing to prevent) rather than internal Hamas-Fatah disagreements. “Palestinian negotiators in Cairo say they have agreed a “comprehensive” deal for a national unity government to take responsibility for running Gaza. A cabinet backed by Hamas and Fatah, which dominates the Palestinian Authority, was unveiled in June. “The territory has been governed by Hamas, which won the last parliamentary elections in 2006, since it ousted forces loyal to the PA in 2007. No effort is made to enable BBC audiences to place that Hamas denial in its correct context by informing them that, despite the establishment of the unity government on June 2nd, Hamas continued to run ministries such as the Ministry of Health and the Ministry of Information – both of which played active roles during the recent conflict. “The BBC’s Kevin Connolly in Jerusalem says bringing unity between Hamas and Fatah is a strategic aspiration for the Palestinians – but differences between the factions are bitter and profound. In line with the BBC’s policy since the beginning of June, Connolly fails to clarify to readers that – despite the placatory assurances at the time of its inauguration – the PUG has failed to live up to the PA’s existing agreements with Israel on various issues, including the disarming of terrorist organisations in the Gaza Strip. Connolly apparently does not consider it relevant to inform audiences about crucial clauses in those existing agreements such as the ban on local weapons manufacture and import. Despite that very clear writing on the wall, the BBC obviously does not see the necessity of making audiences aware of the fact that if Hamas and other terrorist organisations are not disarmed by the PUG and the territory not brought under the sole control of PA security forces, then the Gaza Strip – along with the rest of the PA-controlled areas – will find itself in a ‘Lebanon-style’ situation whereby the actions of a foreign-sponsored terrorist organization can continue to spark conflict whenever that suits its own (or its sponsors’) agenda. Additionally, the obviously relevant topic of the recent exposure of a planned Hamas coup against the PA is once again ignored by the BBC in this report. Nearly four months since the Palestinian Unity Government came into existence, the BBC has still not met its obligation to “build a global understanding of international issues” by providing audiences with anything more than superficial reporting on the topic. That failure clearly not only hampers audiences’ ability to understand current events, but also means that they will be ill-equipped to comprehend any future developments. “Anjem Choudary is a deeply controversial Islamic figure, a man who many Muslims despise because they believe he causes enormous damage to their position in British society. Alongside another now-banned cleric, he once spearheaded al-Muhajiroun, a group that argued that the West is fighting a war against Muslims and Islam. When the government banned the group, some of its former members founded new organisations, including Islam4UK and Muslims Against Crusades – which were also later banned. The latter group’s protests against British soldiers returning from Afghanistan, led to counter-protests and the subsequent formation of the English Defence League. Despite his promotion of Choudary’s denials, Casciani made no attempt to provide readers with an in-depth view of the actual agenda of Choudary’s various groups or of the nature of his opinions – such as his recent statement of support for ISIS and the practice of crucifixion. The following day – September 26th – the BBC News website produced an additional report titled “Radical preacher Anjem Choudary released from custody” which once again included multiple descriptions of Choudary as a “preacher” and context-free amplification of his outlandish claims. The various reincarnations of Choudary’s extremist group under assorted titles have of course been common knowledge for a long time. Neither his prominent position in groups serially banned by the British government, his promotion of bigoted views nor his connections to the export of European Jihadists to the Middle East has, however, presented a barrier to Choudary’s regular invitations to appear on various BBC programmes. 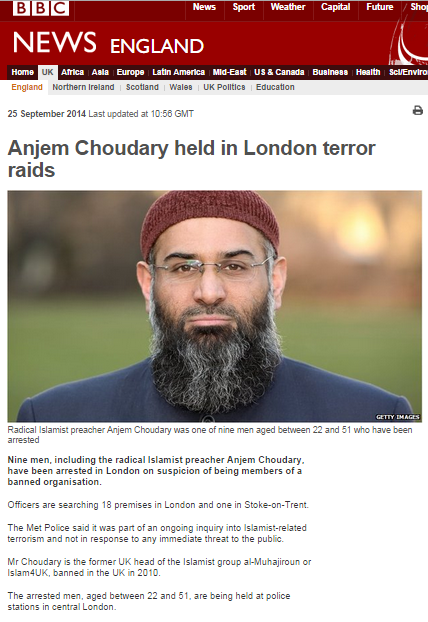 Curiously, that fact was not reflected in either of the BBC’s reports concerning Choudary’s recent arrest. 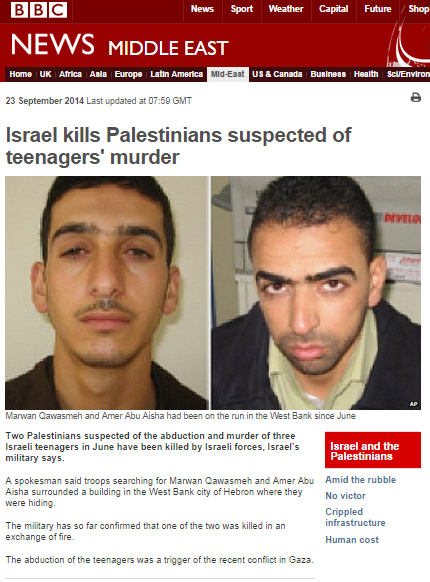 On September 23rd the BBC News website’s Middle East page published an article titled “Israel kills Palestinians suspected of teenagers’ murders“. The original version of the report read as follows. The article was subsequently amended twice but all its versions continue to promote the notion that the seven weeks of hostilities in Israel and the Gaza Strip were caused by the kidnappings and murders of three Israeli teenagers on June 12th. As can be seen, the sequence of events presented to audiences by the BBC completely erases the fact that “the recent conflict” did not only take place “in Gaza” but also in Israel, with thousands of residents of the southern part of the country forced to leave their homes during that time. Even more misleading is the fact that the BBC has completely airbrushed from audience view the hundreds of missiles launched at civilian targets in Israel between June 12th and the commencement of Operation Protective Edge on July 8th. It was of course that incessant missile fire which was the reason for the military operation, with the later discovery of dozens of cross-border tunnels prompting the subsequent ground operation. The military operation could have been avoided had Hamas elected to take advantage of the ample opportunities it was given to stop the missile fire before July 8th, but the terrorist organisation chose not to do so – for reasons not by any means exclusively connected to Israel. There is unfortunately nothing novel about this article’s promotion of the erroneous notion of an irresistible “cycle of violence” and its failure to inform BBC audiences that the events of this summer could have been prevented had Hamas so chosen. Another point worthy of remark in this report is the fact that the penny seems to have finally dropped with regard to Hamas’ involvement in the kidnappings and murders of the three Israeli teenagers. “The militant Islamist group Hamas initially denied being behind the killings but later on its political leader Khaled Meshaal said members had carried them out. That belated epiphany means that the BBC should now ensure that all its previously published content promoting the notion that Hamas was not responsible for the murders (material which of course remains accessible to the general public online) is amended to include a footnote informing audiences that the BBC’s claims were inaccurate. An organization truly committed to editorial standards of accuracy and impartiality would also carry out a review of the role played by Jon Donnison in promoting politically motivated inaccurate information which deliberately misled audiences with regard to Hamas’ involvement in the kidnappings and murders. Here is a recent Channel 2 interview with veteran Israeli journalist Ben Dror Yemini about his new book ‘The Industry of Lies’ which will apparently be available in English soon.